I don't have anything new to share today so I thought I'd show you one of my finished quilts. This is an oldie. I finished this quilt in 2012 but it's still one of my favorites. It's the first quilt I made that I kept for myself and it is the first quilt that I machine quilted (on my old singer machine). I called it "Wishful Thinking" because I finished it in the dead of winter and it reminded me so much of springtime and warm summer days. It's made from a Sweetwaters Reunion Charm Pack that I picked up somewhere in my travels. I decided to keep the pattern simple and use the values of the fabric to create a simple zig-zag pattern. 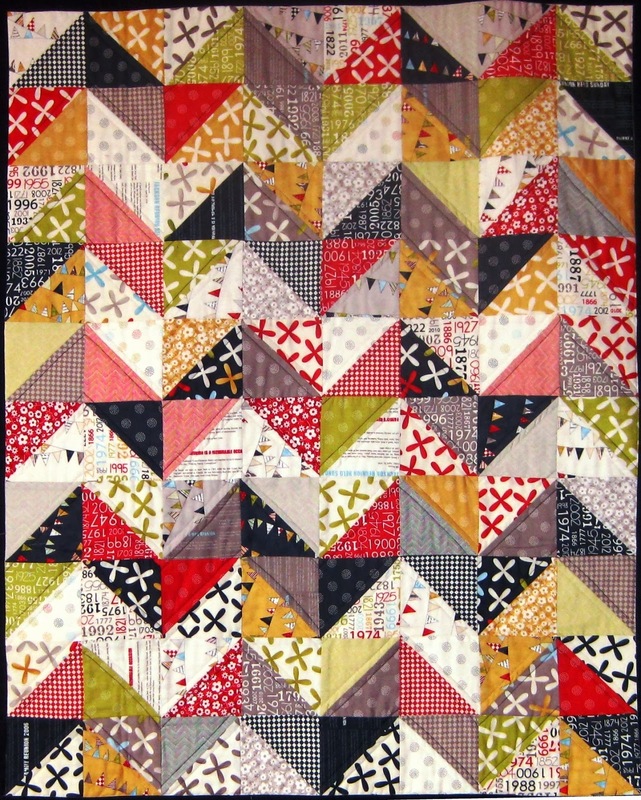 Here is a close up of the free motion quilting (FMQ) on the boarders. I used both navy and white thread to echo quilt the zig-zags on the quilt top and then used the navy thread to do a clam shell pattern on the boarder. This was my FIRST attempt at FMQ and though its definitely not perfect, I'm happy with how it came out. 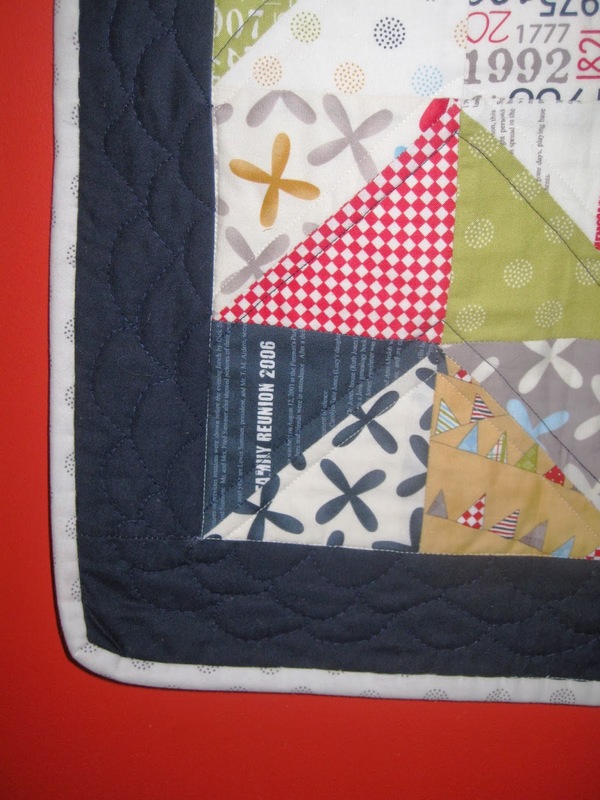 It's fun looking back at this quilt to see how much my FMQ has improved since then. This quilt used to hang on the wall of my old sewing room. Since we moved this fall though, it's still in storage. I can't wait to take it out again though. I always felt it was so bright and cheerful, especially against the bright poppy walls of my old sewing room. Hi there not just jennifer! Love, love love this quilt! Great pattern and fabrics. 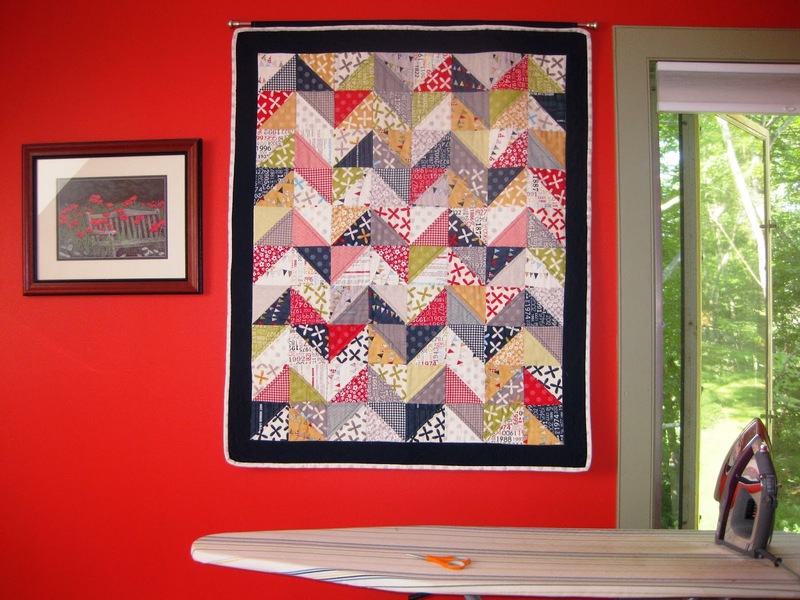 A HST quilt is on my list! Thanks Paula! This quilt was a lot of fun to make and is even more fun to look at! And as for the name, I've also been known to go by Jessica, Julie, and Jeff (to name a few) so I guess I'm also not just Jennifer. Thank you! He really likes the quilt too. I'll have plenty more finishes to share soon!